Eudice Chong ’18 has been named both the women’s tennis NESCAC Player of the Year and Rookie of the Year, as well as a first-team all-NESCAC choice in both singles and doubles, following her tremendous rookie campaign as she surrendered just one set in singles all year with a 17-0 overall record. 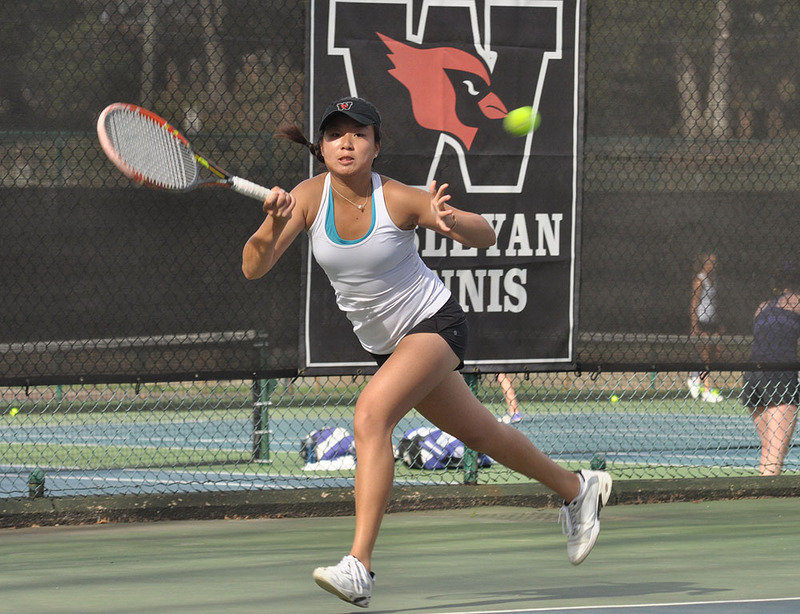 In doubles, almost exclusively with Helen Klass-Warch ’18, Chong fashioned a 20-3 record at #1 doubles. Klass-Warch received a nod to the all-NESCAC first team in doubles. Chong and Klass-Warch also have earned spots in the NCAA Division III Tournament, which will be held in Mason, Ohio, May 18-23. Chong will be one of 32 individuals competing for the NCAA individual title and will join Klass-Warch as one of 16 doubles pairs vying for the title in that area. Team activity is scheduled for May 18-20, while the individuals and doubles competition takes place May 21-23. Chong is the seventh Cardinal to be named Player of the Year in various sports over the last three years. This fall, Wesleyan had both the Offensive Player of the Year (Jesse Warren ’15) and the Defensive Player of the Year (Jake Bussani ’14) in football. Chong and Klass-Warch are the first women’s tennis individuals from Wesleyan to earn qualification to the NCAA Championship. In 2000-01, Wesleyan qualified as a team and defeated Skidmore in the first round, 6-3, before being knocked out by Amherst, 7-2. This year’s Cardinals, with an 11-4 overall record, qualified for the NESCAC tournament for the second time ever and nearly upset fourth-seeded Bowdoin, falling by a 5-4 count. The fifth-seeded Cardinals are ranked seventeenth nationally in Division III by the ITA.